I'm Susan Evans, owner and hostess of Susan's on Smith Island. I am a thirteenth generation Smith Islander. Most of my family still live here and work on the water. 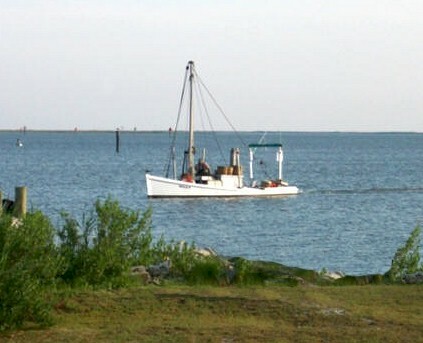 I travel to the mainland by boat Monday through Friday to work at the local hospital, McCready Health. I enjoy meeting and greeting people. It is something I do everyday. When I was nineteen I bought a bungalow-style home built in 1949. In the winter of 2007, I decide to do some renovations to the house and created a B & B. Each room has a wonderful view of the water. There are two rooms available each with a private bath. A cozy living room, a dining room, and a big screened porch overlook the Ewell harbor. I am delighted to share my home with you and give you a taste of what it is like to be born and raised here. My guests come from all over the world to see what our island is all about. 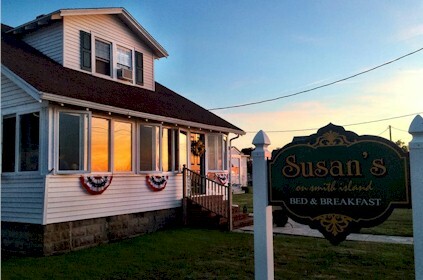 I love saying that I have repeat guests who have been coming to Susan's on Smith Island since I opened the B&B, because they love it here. 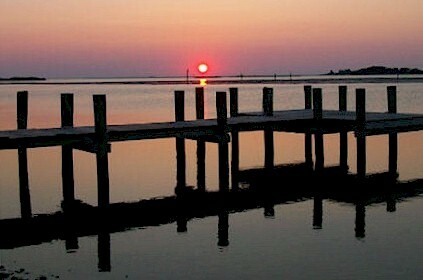 Watch Smith Island Way of Life on WBOC. If you love the outdoors, you will enjoy your stay on Smith Island. There is plenty to do and see. Remove your watch and turn off your cell phone because you are on island time. Bring comfortable shoes. You will want to walk around the towns of Ewell and Rhodes Point, about 5 miles. Along your walk you may find over 300 species of birds. During the months of August and September butterflies migrate along our island. Kayaking is especially nice around Smith Island. There are marked trails with a map available for $3 which goes toward the upkeep of the trails. Bring your own kayak or use one of mine. There is a $10 portage fee to bring your kayak or canoe on the ferry. Bikes cost $5. My bikes, canoes and kayaks are free for my guests to use. Our local gift shops and museum have wonderful handcrafts and art work by the islanders. I do recommended that you bring cash with you because some places do not take credit cards.